Ho-hum. It’s just another GORGEOUS PICTURE OF SATURN’S RINGS! The thing is, it’s not just another gorgeous picture. This image — from Cassini, of course — is truly remarkable. The first thing you should know is that Saturn’s rings are incredibly flat. If you scaled them down to the size of a piece of paper, they’d actually be far thinner than a single sheet of that paper. In fact, even though they’re about 200,000 kilometers across, they are only at most a few dozen meters thick! Daphnis is a teeny tiny moon, just 8 km (5 miles) across. It orbits Saturn inside the broad A ring, and it’s carved a gap in the rings called the Keeler Gap. The gap is about 45 km (25 miles) across. 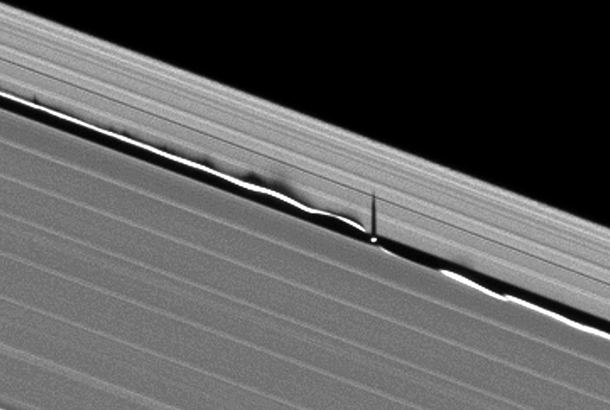 As it happens, Daphnis has an orbit that is not perfectly circular, so sometimes it’s in the middle of the gap, and sometimes near the inner edge. Not only that, but the orbit of the little moon is tipped a bit, so sometimes it’s a bit above the ring plane, sometimes a bit below. When it’s near the inner edge and also above the ring plane, it pulls the nearby ring particles up out of the ring plane with it. When it’s below the plane it pulls the particles down. When the elliptical motion of the moon is combined with the tilt, the gravitational interaction on the ring particles produces vertical ripples in the ring. These ripples have been predicted in the past, but now Cassini has clearly imaged them for the first time. Right now, Saturn’s tilt is such that the rings are almost edge-on to the Sun (I’ve explained this in more detail in an earlier post). If you stand outside at sunset in a flat area, you can see your shadow stretching for a long way… and the same is true at Saturn. The rings are flat, and the Sun shining almost parallel to them, so any deviation from flatness is obvious by the shadows. And that’s what you’re seeing in those images. 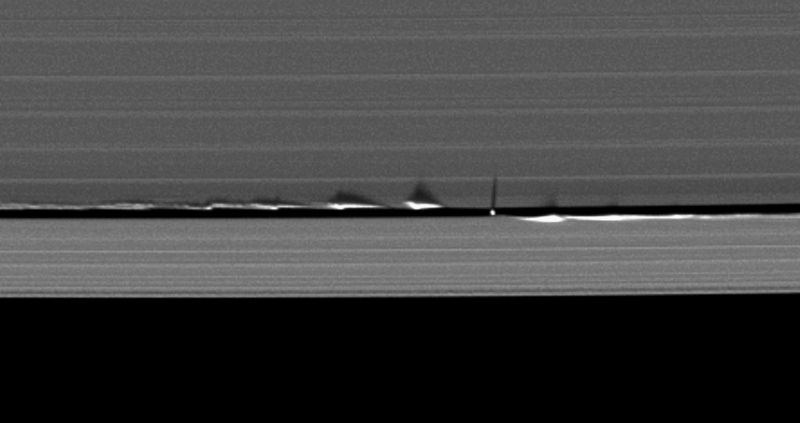 Daphnis is the obvious white lump in the image with the long, black, triangular shadow stretching beyond it. And you can clearly see the ripples it causes in the rings, too! 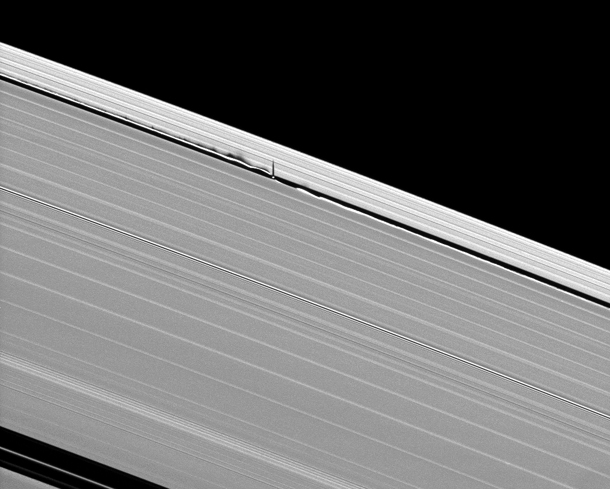 To the left of Daphnis the waves are on the edge of the rings outside the Keeler Gap, and on the right they are on the inside of the Gap. This may seem weird — it threw me for a moment — but remember the rings are made of particles that are traveling at almost but not quite the same speed as the moon itself. The particles in the ring outside the moon’s orbit (farther from Saturn) move a bit slower, and inside the moon’s orbit (closer to Saturn) move a bit faster. So it’s like cars on a racetrack, catching up and passing each other. When Daphnis passes the outer edge particles it pulls on them, and as the particles on the inside edge pass Daphnis they get pulled too. The combined motions are pretty complicated, but add together to produce the effect you see here. And what an effect: those ripples are big, from 0.5 to 1.5 kilometers (1/3 to 1 mile) high. Even then they’re dwarfed by the immensity of the rings, though, which only rams home the scale of these images. We thought that this vertical structure was pretty neat when we first saw it in our simulations, but it’s a million times cooler to have your theory supported by such gorgeous images. It makes you suspect you might be doing something right. True. But of course, that’s the essence of science. Predictions aren’t terribly useful unless they’re borne out by observations, and I agree strongly with John: it’s even better when images this spectacular have your back. Science! Pleasing to the eye and the brain.